Finding new colour combinations I like makes me disproportionately happy. I know this doesn’t apply to every menswear enthusiast, but for me the interrelationship of colours is one of the most enjoyable and creative aspects of dress. Particularly in menswear, where colour is often so limited. 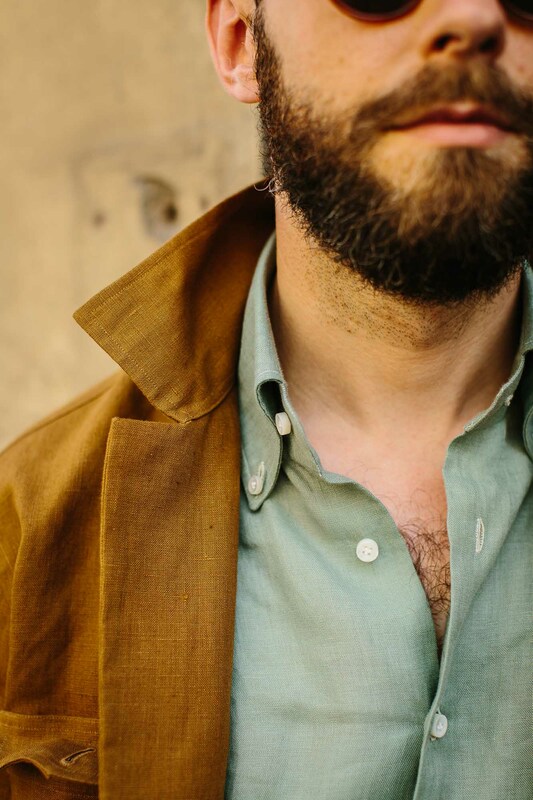 This combination made me happy: sage-green shirt, tobacco-brown safari jacket, and cream-cotton trousers. 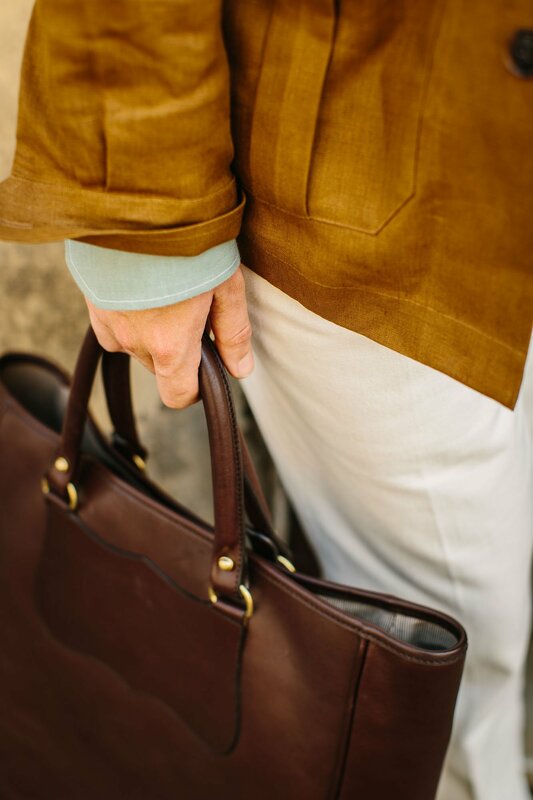 Accessorised with brown shoes (suede, Baudoin & Lange Sagans) and a brown bag (leather, Frank Clegg x Michael Bastian tote). The shirt we have referenced before, as one of the three linen pieces I had made by D’Avino. I said then that it was hard to wear with anything but blue (including denim) and white/cream, and I stick by that - the shirt needs the off-white trousers here (from P Johnson, reviewed on Wednesday). It’s an important point, for this shade of green often pops up among summer offerings by Italian brands, such as Fedeli. However, once the shirt has an effective partner, I find all manner of jackets or blazers can be worn over it. A brown-suede blouson perhaps or - as here - a tobacco-linen safari jacket. It is made from very stiff linen, which means it holds a shape very well, even if it’s not as relaxed as overshirts from others such as Drake’s. It can hold a mobile phone easily without distorting the cut; but you do feel you’re wearing something closer to a jacket than a shirt. Looking back, I think the combination appealed particularly because it was summery, but not as bright as many summer menswear outfits. There is colour here - great colour - but it does not have the sugary pinks or acidic yellows that often characterise ‘resort’ collections. Strong and summery, but organic and natural. Helped by all the browns elsewhere. You can follow the discussion on Sage green and tobacco brown – earthy summer by entering your email address in the box below. You will then receive an email every time a new comment is added. These will also contain a link to a page where you can stop the alerts, and remove all of your related data from the site. I like this outfit and color combination that fits perfectly into the italian city where the pictures were taken! You seem to wear your B&L loafers quite often these days but which footwear do you choose to wear all day when on holiday?I say this because Belgian loafers or Italian mocs are not very comfortable outside for extended periods whilst taking in the local sights. I was in Venice, Bologna, Modena and Florence this Summer. I had with me my B&Ls, Common Projetcs, Gomminos and John Lobb Lopez in Suede and ended up wearing the Sagan all the time. They are so comfortable. And when they’re not in Suede also quite robust. The Lopez is a fantastic shoe. Do you have it in brown suede? Yes, I have it in Dark Brown Suede and Tobacco Suede. Very versaitle. This article particularly caught my eye as I have a shirt from Our Legacy in a near-identical colour and a very similar jacket from Private White in a completely identical colour. I have never worn them together but certainly will do now. Like you, I have struggled matching trousers to the shirt and have ended up wearing it exclusively with denim. I’m out for a casual dinner this evening, so may try something very similar to the combo you’ve recommended above. Good timing, thanks! Lovely colors! The photography is also really good to show off the color combo, even the beard’s color matches with the aesthetics in my humble opinion. Luca Faloni also has a nice linen shirt in similar colour for those interested. I can vouch for the service from Luca Faloni. I had cause to return a faulty item in exchange for another and the manner in which the whole thing was handled was exceptional. Seconded – they sent me a linen scarf instead of a linen towel. Before I’d spotted the problem they had sent out the towel and told me to keep the scarf. Hi Simon, I realise it may sound a bit prosaic but it would be really helpful to see your pieces shot on a mannequin (or even the hangar). If you could produce some full length front and back images of all your clothes it would aid in comparing them, particularly with the advantage of consistent lighting rather than the (admittedly aesthetically lovely) lifestyle lighting you normally employ. I suppose you might need a bespoke mannequin to get the full benefit of the fit though? Could be an interesting commission. Yes, when I’ve shot pieces on mannequins (see the post on double breasteds compared) people do say they are better seen on me! This is a truly great look and the colour combination is absolutely right for you. Jason King would be proud of you albeit he may have suggested adding a PS neck square. That said, given that this jacket is not available in the UK and seems to be sold out in the US, what would be the second choice ? Bravo for geting back on track. It’s not the colour butr ather the style. This colour would not be right for me. It’s the style that’s interesting. I already have an A&S work jacket – that is a great but slightly different proposition. It’s more casual. My question is on the safari Jacket front ? Chad Prom, or Bryceland’s x Ascot Chang? Have you tried either in person Johnny? The issue I’ve had with all these versions of safari jackets is that the weight and feel of the linen can vary hugely (as mentioned, Drakes v Armoury, effectively shirt v jacket). Interested to know how those two compare. I have the Brown from Chad Prom and I am quite satisfied. It’s rather on the soft side tough. Bryceland has one in solaro and one in linen and they look like they hold up quite different. So as you say, fabric has a big impact. Hi Simon – related question. I note that your shirt has a button collar but seemingly no placket. What are your thoughts on placket vs no placket when it comes to button downs? I actually have both but I was sneered at by a young iGent when ordering from Luca recently. I realise this question is entirely vacuous. Ha! Well, I guess it is but there are more vacuous things. Plackets are less formal, but I have no problem having one with a button down. Anyone that sneers at such things needs a little perspective. FWIW I have never had plackets on any of my bespoke shirts. Great color combo! Is it bad that those earthy tones are already getting me excited for fall colors and textures…? Do you know anything more about English Cut / Thomas Mahon going bust? Is it only the MTM bit or the bespike part too? Thanks Simon. Something you, with your vast netwirk in the industry, can find out more about? I know of several customers of EC who have not heard anything and are now worried their commissions will not be completed and their deposits forfeit. It sounds like a sorry state of affairs. As long as Thomas Mahon’s still taking bespoke clients, it’s no big loss to any of us out here. I suppose poor Tom will have taken a bath, and will need somebody to bail him out before he can get back into business. Honestly, I find this specific combination of colors very hard to fancy, to begin with. 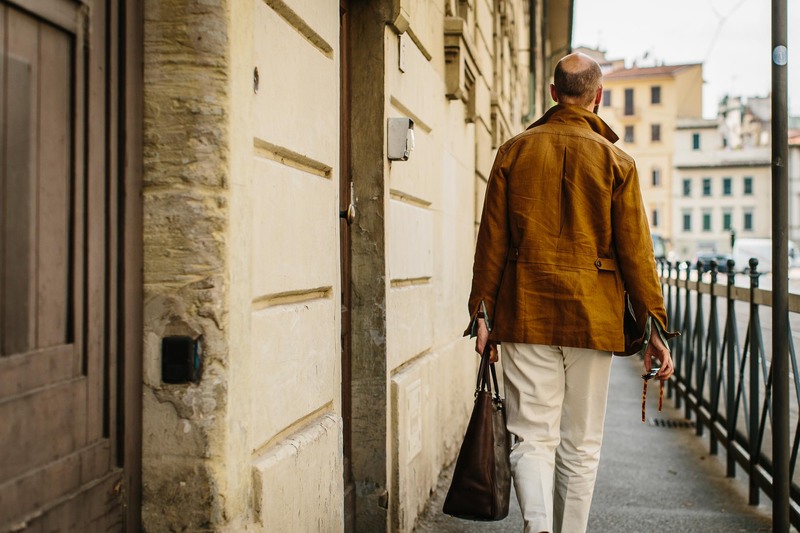 This is not at all the Pitti guy’s type of combo! It’s so unusual that I really wonder whereabout you did find your inspiration! I completely agree with you on all that you wrote in this post! A very convincing combination, this shirt makes it a lot more interesting than a blue one would, I think. Would you also wear this shirt and jacket with navy chinos? Probably not, but it would be worth a try. I think this whole Safari / Work Jacket evolution deserves a separate piece. They represent a great alternative to more formal jackets but as well as the design, the fabric determines their wearability. I bought a heavier linen a couple of years ago form Richard James and I bought the A&S in cord – both are fabulous and I rarely have them off my back. That said, I also bought a linen from Drakes and it is so soft it really is right at the casual end of things and I really only wear it when it’s very hot or for the beach. Thanks David, and yes that would make a good piece. Great outfit as ever, Simon! One question: do you have any recommendations for a smaller bag? The tote in the pictures does look fantastic, but one doesn’t always want to take such a big bag out, especially when there’s not much to bring. Thanks! 1) what temperature range do you usually find yourself wearing a safari jacket? I’d wear one like this in temperatures of 30 degrees plus, mostly. 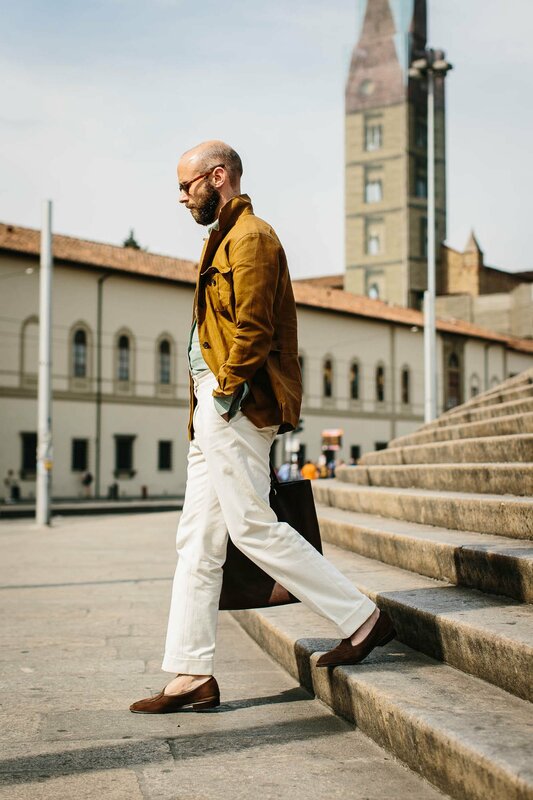 If you can’t wear any kind of jacket where you live, that’s frustrating, although a linen safari is going to be the thing that works if anything does. Hi Simon. On the topic of safari jackets and weather what do you think of the fall/winter versions of this garment? You seem to like the style but I have never seen you wearing other than linen pieces. I have seen some in tweed and wonder about their versatility. 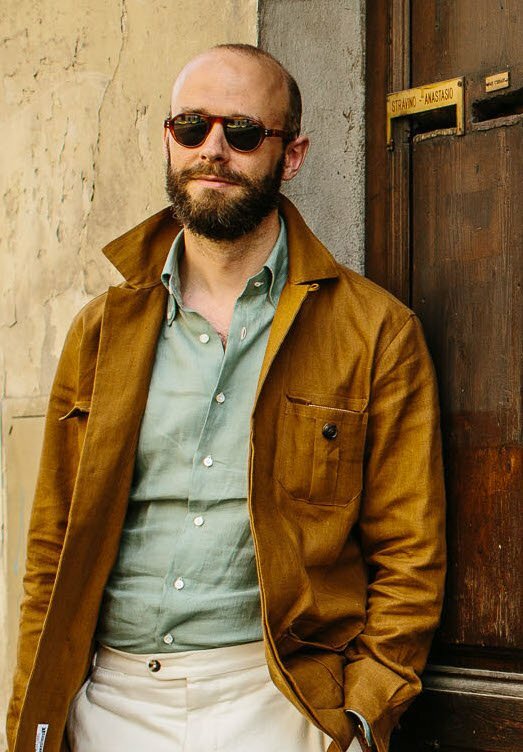 On a different topic may I suggest a post on the top 5 coats/casual jackets a man should own for a versatile capsule wardrobe? Thank you and congrats on the blog’s 10th anniversary. No you’re right, I don’t really wear A/W versions of them – it’s more when you want something lighter and easier than a jacket, normally when it’s hot. One of the things I notice here is how well the colors of your outfit play with the colors of the city around you. Do you take that into account when you dress? I often find myself thinking about the palette of the city I live in (Taipei) when I buy clothes. Simon, what size is the jacket? And would you say it might be too roomy for a rather skinny man with broad and high shoulders? Hi Simon – what size is the safari jacket you’re wearing here? Thanks. Hi Simon. Looks like The Armoury is now offering this safari jacket in three colors: navy, brown and oatmeal. Which one would you say is more versatile? Would you ever use these type of jackets in the office? Say on a casual Friday in summer? Thank you Simon. You have mentioned elsewhere in the blog that you like the fact that your Drake’s navy overshirt has chest pockets but no hip pockets. Is that on account of formality or other reasons? I ask because the Armoury version has hip pockets and you seem fine with that one also. Yes, good point. Generally I dislike it because it seems too redolent of a traditional safari jacket and too fussy. With the armoury one it’s a bit better because it’s so obviously a jacket and not an overshirt – partly due to the stiffness of the linen. I note that you never sport the tote that you designed with Globetrotter. Has this item ultimately disappointed you and if so, why? No, not at all. I just never kept one myself, which I really regret. That’s a shame because it would be great for you to re-visit these projects over time and comment on how they are ageing and wearing. For me the PS tote is a big success and it is definitely my go to bag. It is much commented on and the dimensions are perfect. Only one issue, the side gussets seem to be ageing lighter than the front and back. A strange phenomena given that they are less exposed. Maybe I need to pop into Globe-trotter and ask how they recommend I treat it ? Thanks David, yes I know. We sold what we had and I forgot to add one for myself. The gussets are made from a different, softer leather than the body, so I’m not surprised it’s ageing differently. I am struggling a little bit to find out how long the arms of an Overshirt or Safari-Shirt should be. Especially in relation to the length of the Shirts arms. How do you wear yours, what are your thoughts about this? On the pictures it seams to be the same length as your shirts. I have seen the D’Avino Safari jacket a couple of times “in the flesh” as it were but until I saw the latest iteration with the one piece collar had always held back. Now I can’t! What are your thoughts on it? I am also inclined to follow better judgement and go for navy rather than tobacco; more flexible would you say? That would definitely be more flexible, yes. I went with Navy. I think it is such a remarkable looking piece of clothing. Hopefully it’s something you’ll review in the future.